Link Up Your Diverse Children's Book Posts Saturday launched another new #diversekidlit hop - please join to share and promote diverse books! #3rdfor3rd: The Phoenix of Destiny. Find out why Geronimo Stilton fans are drawn to this new, longer series! Kid Lit Blog Hop for June. The monthly #KidLitBlogHop also went live this week. Check in and share any kid lit related posts and reviews. 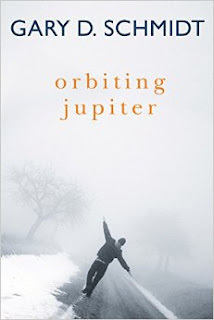 Orbiting Jupiter (2015) by Gary D. Schmidt is the 12 & up choice for next fall's Global Read Aloud, and I wanted to get a jump on thinking about it for using with my seventh graders. The story revolves around two boys: Jack, whose family has taken in a new foster child, and Joseph, the foster brother who is already a father as a middle schooler. The story of their relationship and time together make the core of this slim novel. My biggest question is whether there will be enough here to sustain the full six weeks of the Global Read Aloud with such a short book. I'll be interested in hearing from others thinking about using this one with kids. 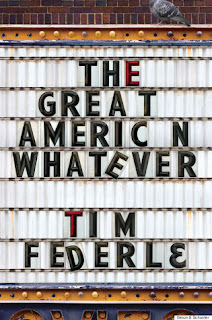 The Great American Whatever (2016) by Tim Federle. I loved Tim Federle's middle grade Nate series, so I was curious about this latest foray into YA, and he did not disappoint. Tim Federle has created yet another engaging, entertaining, and fully-aware gay main character that readers to root for. This is definitely a book aimed at the high school end of YA and touches on many "mature" topics like drinking, strong language, grieving, and losing ones virginity. But at its heart, this is story about finding your place in the world and understanding that the people who know you the best might know more about you than you realize. I thought Orbiting Jupiter was a very compelling novel, which should generate lots of conversation about Joseph (I don't want to say any more and make it a spoiler). The Great American Whatever...I also loved Federle's Nate books, but try as I might, I could not get into this one and finally gave up. I will be interested in hearing what you think of it. I enjoyed The Great American Whatever, but I can see why it might not really hook others. With Orbiting Jupiter, I am just worried that six weeks is a long time to draw out a fairly short book (that, as you know, packs most of its punch right at the end). Both of these books are ones I really want to read! I love Federle's Nate books so much, and Schmidt never disappoints. I have actually had both books on my list! I am glad to read your reviews. Thank you for your thoughts! Happy reading this week! Thanks, Ricki! Will be interested to hear what you think of them. Orbiting Jupiter was an amazing book, but difficult to read. Oh, the emotions! Federle's book was one I enjoyed, but not as much as the Nate books. Agreed. I listened to the audiobook for Five, Six, Seven, Nate! and having Tim Federle read it was such a joy. Orbiting Jupiter is a very powerful read. I think grade sevens really appreciate it. We have multi age at our school – combinations of 5/6/7 - i'm not sure how it will work with our younger readers. Given that it is a read aloud at least it can be unpacked with the teacher. I'm on the hold list for the Great American Whatever. Thanks for the vote of confidence, Cheriee. Definitely gives food for thought by the end.